Scotland has great Atlantic salmon fishing. Famous rivers, Spey, Tay, Dee, Tweed, Helmsdale, Nith and more. The hundreds of rivers and burns in Scotland are home to many, many thousands of salmon, some of which swim a long way into the mountains to reach their home pools to spawn and start another cycle of their amazing life story. The young salmon grow in our clean waters for a few years before starting their epic journeys to the salt water feeding grounds via the North Sea and the Atlantic Ocean. Some of them reach the Davis Straight on the west coast of Greenland before heading home again, a distance of 6000 miles as the crow flies! On their return they battle their way past nets, killer whales, dolphins and the thousands of seals that prey upon them around the coasts. The survivors, a small percentage of those that hatched in our rivers return home safely to reproduce and provide thrilling sport for the angler fortunate enough to encounter them. Scottish salmon fishing seasons for various river systems. Scotland offers salmon angling of all types, from harling or trolling on the mighty rivers and lochs to intimate single handed fly fishing on one of the smaller streams where a trout rod is sufficient to tempt the king of fish. Salmon fishing is available somewhere in Scotland from 11 January until 30 November although some rivers do not open until February and some close on 30 September. 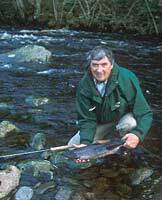 It is said that runs of salmon may arrive in our largest river the Tay on any day of the year but of course there are peak times for sport-fishing. Spring salmon are the earliest running multi sea winter fish. In most rivers the main runs start to arrive in March. On the Tay they can arrive much earlier but generally the numbers are fairly low until then. April and May are the hot times for spring salmon. These fish can be large, most years specimens of thirty or more pounds will be encountered on the larger rivers. In general the two sea winter class of salmon in early spring weigh between 7 and 12 pounds and the three sea-winter fish can be double those weights. By June the first of the grilse or one sea-winter arrive and continue to run from then until the end of the season, their weight increasing with each passing month. Large multi sea-winter fish are interspersed with the grilse to add spice to the sport. By autumn some of these fish can be veritable monsters.